On 7 August, the Permanent Representation of Georgia to the Council of Europe organised an event dedicated to the 10 years after Russian-Georgian 2008 war. 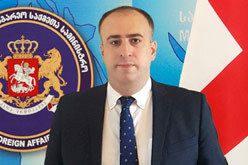 The Permanent Representative of Georgia to the Council of Europe, Ambassador Irakli Giviashvili addressed the guests regarding 2008 August war, the Government of Georgia’s initiatives on peaceful resolution of the conflict and the steps undertaken by the Government on this matter. A special attention was drawn to the international legal aspects of the August war. The speech by the Ambassador was followed by the discussion. In the framework of the event Tako Robakidze's short video "Creeping Borders" was screened. The event was attended by the representatives of the diplomatic missions accredited to the Council of Europe.